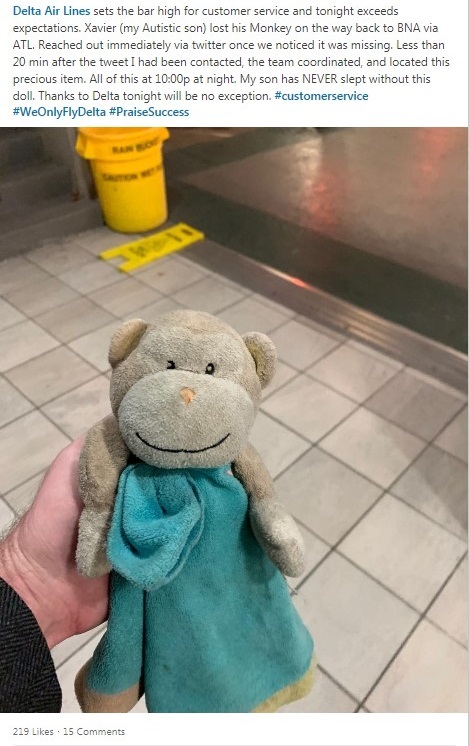 Delta customer Wesley S. sent a frantic tweet to Delta at 10 p.m. Nov. 19, after noticing his son Xavier who has autism had lost his beloved monkey stuffed animal on his flight to Nashville from Atlanta. Delta Customer Engagement Center specialist Breanna Ricketts came to the rescue, responding in less than 20 minutes and coordinating a team to locate the precious cargo. "I immediately saw how important this was, since Wesley mentioned in his tweet that Xavier has slept with the monkey stuffed animal since he was one day old. For children like Xavier one little thing can make a big difference, so I knew I wanted to step in and do everything I could to help," said Ricketts. "I couldn't have done it without the help of the baggage team in Nashville." Breanna is one of 150 full-time Digital Customer Engagement Center specialists, who deliver timely service to customers through their preferred channels in an effort that is increasing customer satisfaction and loyalty. The team works with customers around the clock, every day and facilitates 24/7 two-way feedback to Delta's global operation via the Operations and Customer Care Digital Engagement desk. Spread across five cities, Delta's team of Digital Specialists supports customers in English, Spanish, Portuguese, Japanese and Chinese. Wesley posted to LinkedIn in appreciation: "My son has NEVER slept without this doll. Thanks to Delta, tonight will be no exception." Tori Forbes-Roberts, V.P. — Reservation Sales and Customer Care, celebrated the great work of her team. "This is one of the thousands of connections Delta's Reservations and Customer Care team facilitates every day. As an airline, we are known for connecting people physically, but I'm most proud of my team when they connect with customers emotionally. It's that emotional tie that's core to our business."